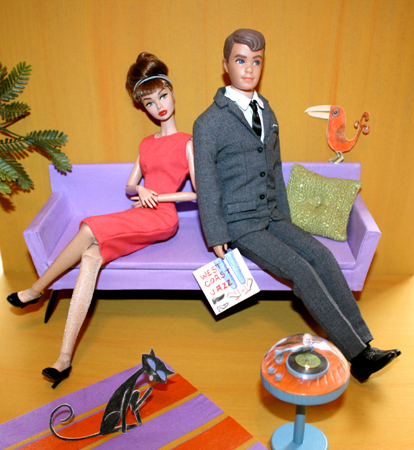 Maryann Roy creates beautiful furniture and interiors for fashion doll collectors, toy companies and doll magazines. Her intricate work has featured in the magazines Haute Doll, Barbie Bazaar, Dolls in Print, Miller’s, American Miniaturist and Fashion Doll Quarterly. 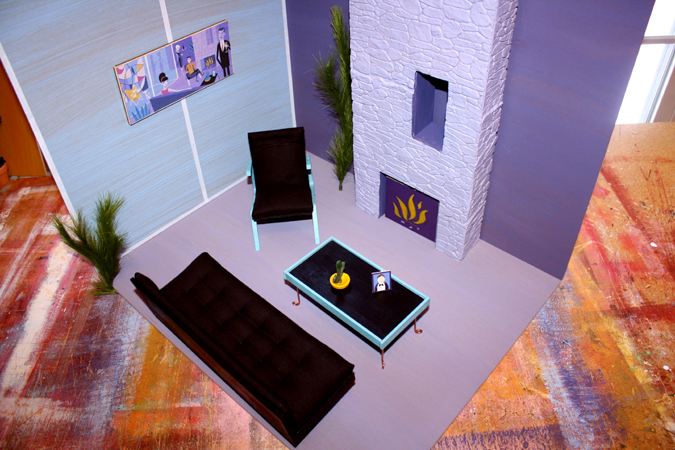 Maryann is also the entrepreneur behind Welcome Home Studio: Furnishings & Set Design in 1:6 scale. 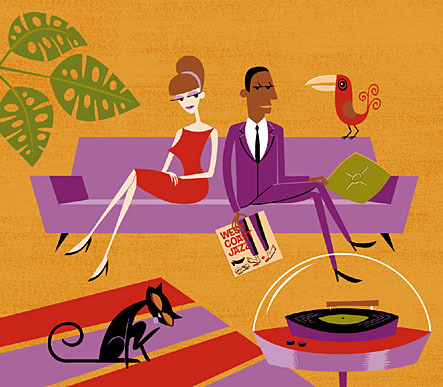 In 2012, Maryann combined her love of Josh Agle’s paintings with her creative talent to produce three miniature vignettes. 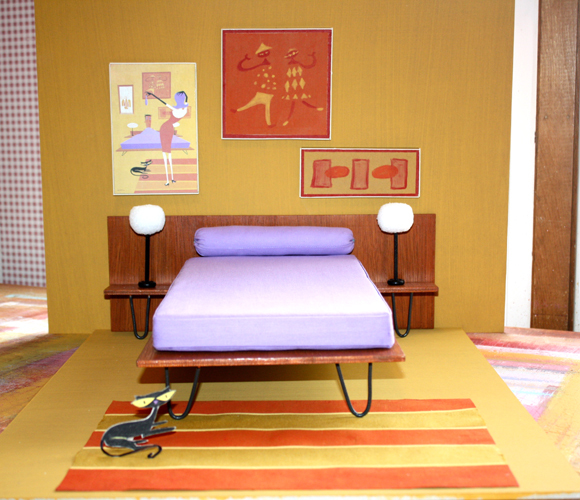 Each set recreates a popular Josh Agle painting for fashion dolls to live within; including the room, furniture and accessories. Bringing the bright and colorful pictures to life literally adds a new dimension to what we typically see. 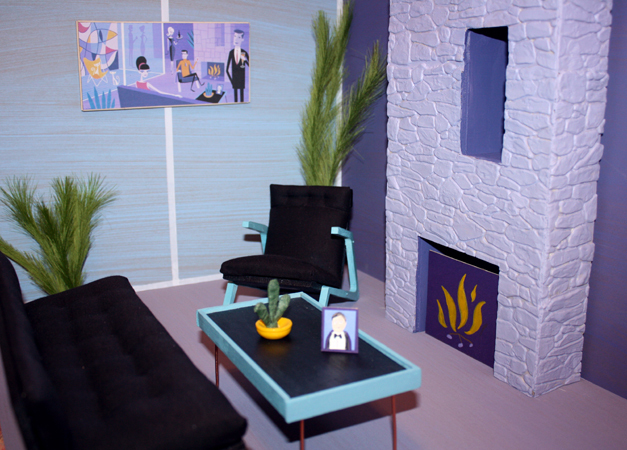 Note that the sets do not include the dolls, although they appear in photographs below for illustration, as collectors prefer to include their own. Shag painted West Coast Jazz in 2003 for Space Force Gallery’s Music After Midnight Exhibition. A corresponding print was released in 2005 for the parallel exhibitions L.A. By Day at the Earl McGrath Gallery and L.A. By Night at the La Luz de Jesus Gallery. 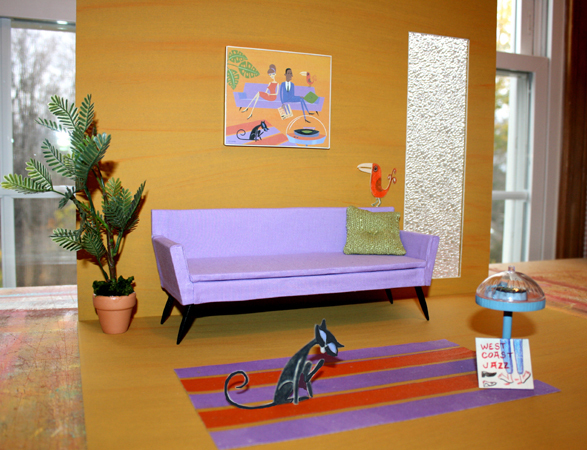 Maryann brought the West Coast Jazz artwork to life as a 3D scene by handcrafting the stylish mid-century modern furniture, record player, album sleeve, animals, potted plant, wall and floor (each measuring 20” by 16”). A framed copy of the West Coast Jazz picture is hung centrally over the purple sofa. Shag’s original Rose Seidler’s House painting and serigraph print were released at the On the Shoulders of Giants Exhibition held by Australia’s Outré Galleries in 2006. Rose Seidler’s House is the largest of the three vignettes and includes two walls and a floor (approximately 20” by 16” each) plus the stonewall fireplace, mid-mod furniture, plants and a framed portrait. A scaled copy of the Rose Seidler’s House picture is hung on the left-hand wall. Shag produced The Dangling Reward artwork for the Hedonist Confidential Exhibition hosted by the Sydney Opera House Studio and Outré Gallery in Australia during 2002. 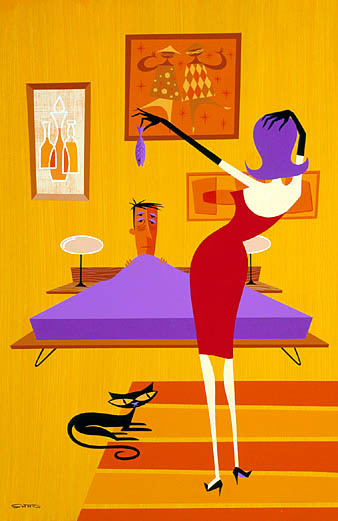 The final vignette recreates the bedroom scene depicted in The Dangling Reward painting. 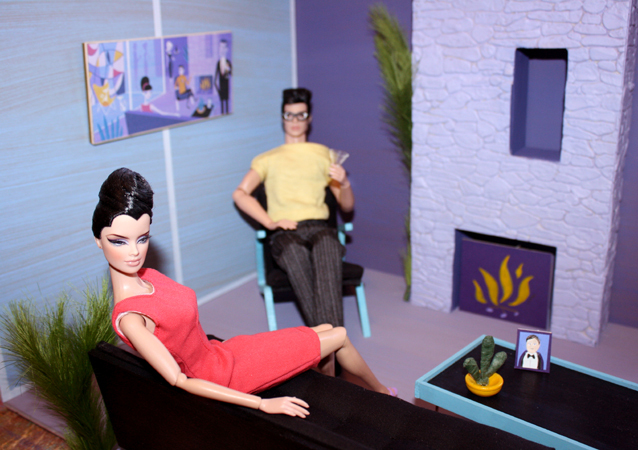 Maryann previously won a first prize in the Mattel Mad Men Photo Contest, so it is not a surprise that the 1950’s Mad Men styled furniture is stunning. Glitter lamps adorn the side tables of the bed with its purple mattress and bolster. 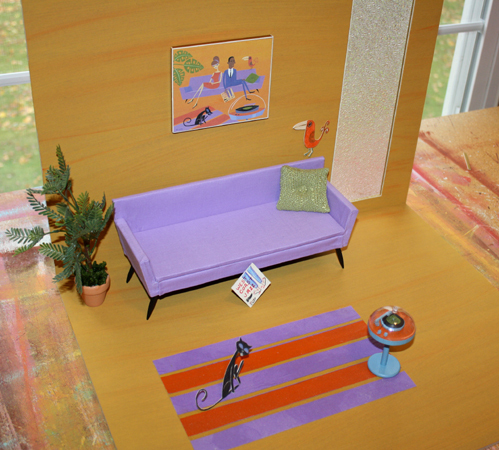 The room set also includes a rug, framed paintings, black cat and purple fish. The back wall measures 20” by 16” with the floor a slightly smaller 20” by 14½ “. Many thanks to Maryann Roy for allowing me to reuse the original photographs from her 2012 blog post. You can read more about Maryann’s work on her blog, Facebook and Instagram feeds, and website. There are also some great interviews and reviews available on the blogs Electric Ladyland, Fashion Doll Review, Retro Renovation, Mirror Mirror, and Eloise Moorehead. These three Shag-inspired vignettes are sold, but if you are interested in purchasing from Maryann’s Welcome Home studio then please see her blog site. Interesting Fact: A plangonologist is a collectors of dolls.